The key word is in the title - invest. The value of having a wedding planner can take your wedding from being a stressful, standard affair to a wonderful, stress-free occasion with details that will make your wedding stand out from the crowd. As a wedding co-ordinator, we have met with a huge variety of wedding suppliers - bands, DJs, photographers, florists, bakers, limo drivers...and trust me, we have seen the good, the bad and the ugly. As your wedding planner, you can trust that only the best have made the cut when it comes to the shortlist. Having a good relationship with these vendors means that we may be able to negotiate a little on price, but the most important factor is that you are guaranteed the very best service. When working as a wedding co-ordinator a few years back, I remember a particular wedding where it was a couple of hours before the bride and groom were due to arrive, and there was no sign of the cake that was due to be delivered that morning. To make matters worse, the baker's premises were located minutes from the hotel! I called the baker to check up and got a vague response that the cake was 'almost done'. With 30 minutes to go and still no cake, I made another harried call. Eventually they rushed in to a venue minutes before the bride, and spent quite some time setting it up while we delayed the couple outside. The beauty of a wedding planner? That baker will never be on my list of recommended suppliers. 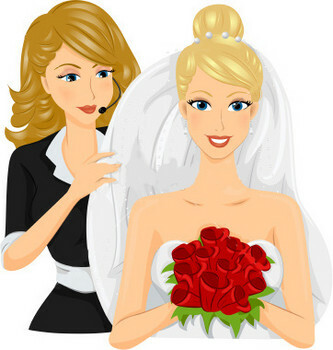 A wedding planner has relationships built with venues and suppliers, but it is not a favourites game. Our duty is to first understand your personality and taste, and then match it to the right vendor. While your best friend/cousin/sister might recommend the band they had for their wedding, who's to say that it will suit your wedding? They will only get married once (hopefully! ), where your planner will encounter hundreds, even thousands. Your planner will be there to help you with the planning process, but also to liaise with your suppliers and the venue on the day. As much as your family members can help, you will still want to make sure they enjoy themselves on your wedding day and not spend the whole time running around ensuring the flowers have been brought from the church to the hotel, or that the favours are out, or to make sure the band are set up on time. That is where your planner comes in - we are working for you, and will be the person working away in the background to ensure everything is exactly the way you planned for. You are going to be spending a lot of money of your big day, it might as well be worth it! Well put that vendor referrals are not a favorites game! We are professional matchmakers for our client-vendor relationships and we take great pride in finding them “the one.” Great post! Looking forward to reading many more, and sharing with our brides as well!